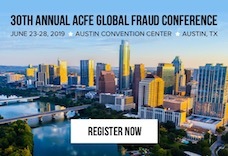 The contrition of convicted fraudsters* who speak to attendees at the end of each ACFE Global Fraud Conference ranges widely. Some are desperately sorry and others are still rationalizing. Former bank executive James Scalzo, who went to prison for bank loan frauds totaling $1.4 million, seemed to want to convince attendees of the full repentance of his crimes. “I want you to know that I did it, I’m responsible for it and I own it. It’s my mistake,” he said, with a catch in his voice, during the Wednesday closing session. “If I can discourage or stop one person from making the same mistake I made, all the pain and suffering would have some sense of giving back and be worth it. Between April 1, 2008 and October 31, 2009, while Scalzo was employed as a bank officer at Fox River State Bank in Burlington, Wisconsin, and then Consumer’s Credit Union in Round Lake Beach, Illinois, he originated and approved multiple fraudulent loans, according to the Eastern District of Wisconsin U.S. Attorney’s Office. He wrote the fraudulent loans using the names of people — including some of Scalzo’s relatives — who weren’t qualified to receive the funds or didn’t know Scalzo was using their names on loan documents, according to “James Scalzo sentenced to 35-month prison term for bank fraud,” by Cary Spivak, the Milwaukee Journal Sentinel, July 19, 2013. Scalzo’s victims included an elderly couple whose home he used as collateral for a fraudulent loan by forging the owners’ signatures, according to the Journal Sentinel article. The home later went into foreclosure. Scalzo transferred funds from the loans by cashier’s check or wire to his personal accounts. He applied some of the loan funds against earlier loans to conceal the $1.4 million fraud. Scalzo served 27 months of his 35-month sentence. In 1989, a helpful Kenosha, Wisconsin, banking executive pulled Scalzo out of the bank’s mailroom and placed him in a management training program. He worked his way up the ladder to the commercial lending department. Scalzo said he wanted an eventual avenue out of banking, so he began to pursue investment real estate on the side. He and his partners would buy properties to rehab and flip, but they then had a cash flow problem, and the market began to crater. “So, I panicked and made a loan that I benefited from,” Scalzo said. “Wrong, horrible, disgusting indiscretion. And I used my aunt and uncle’s home as collateral because I didn’t have the credit authority to give myself or my partners an unsecured loan.” The jig was up when mortgage paperwork showed up at his aunt and uncle’s address. They turned him into the U.S. attorney’s office for fraud. “I appreciate what you folks do for a living,” Scalzo said. “When I saw the [ACFE conference] website and I saw ‘Where Heroes Unite,’ I thought these people invited Lex Luthor to give a speech to the Justice League! * The ACFE does not compensate convicted fraudsters.